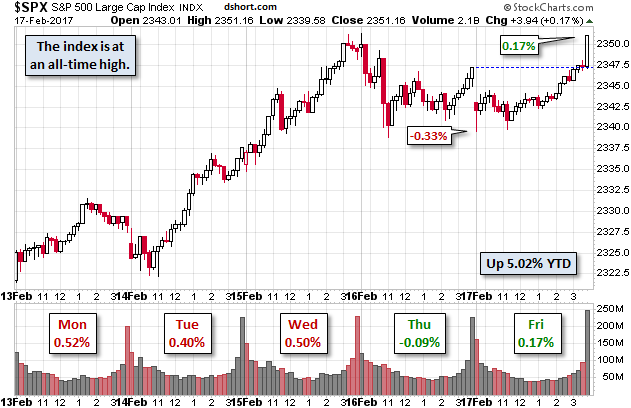 The market melt-up continued last week, with the S&P 500 rising by 1.51 percent to 2,351.16. That was another new all-time closing high for the benchmark index, which is now up 5.02 percent year-to-date, a nice start to 2017. 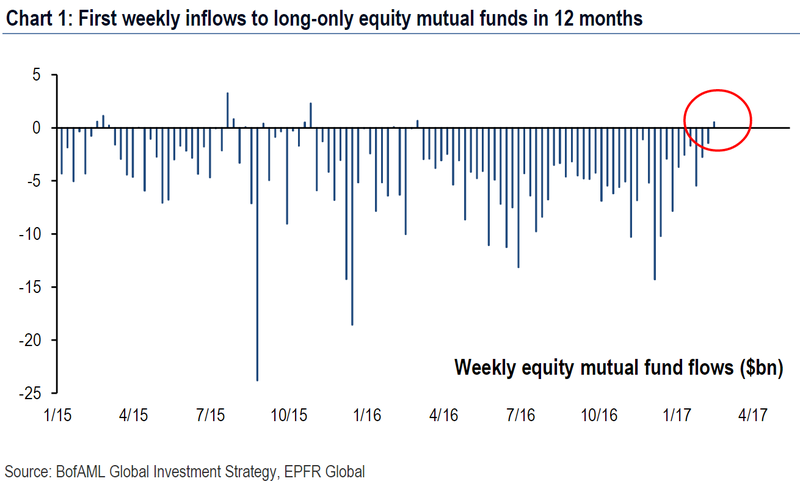 In fact, every major stock index rose to fresh record highs last week, and net flows in and out of long-only equity funds turned positive for the first time in roughly a year. 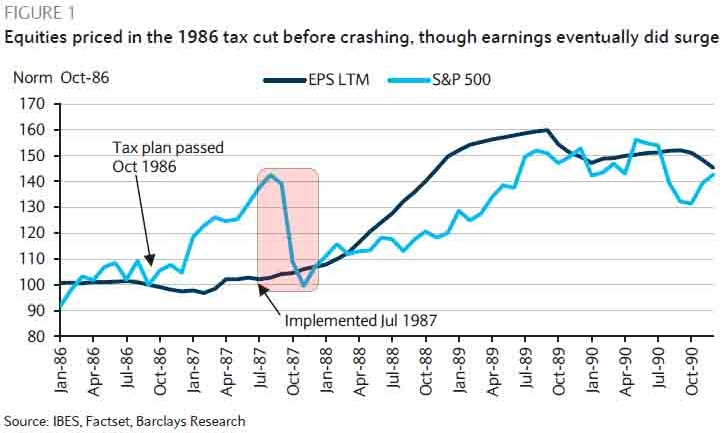 That could simply be a side effect of investors chasing returns, i.e. 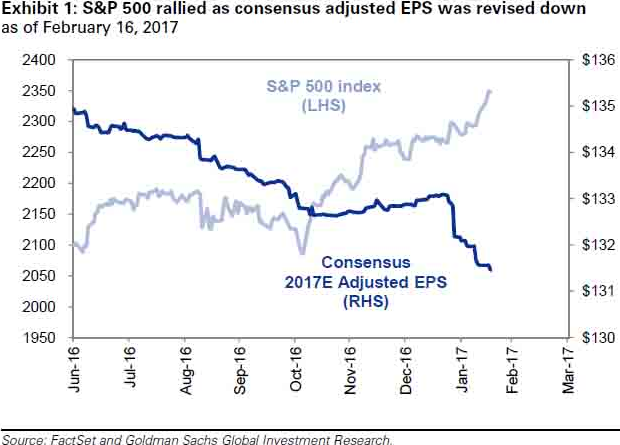 reluctant participants who had stayed on the sidelines (cash) finally being forced to buy stocks. 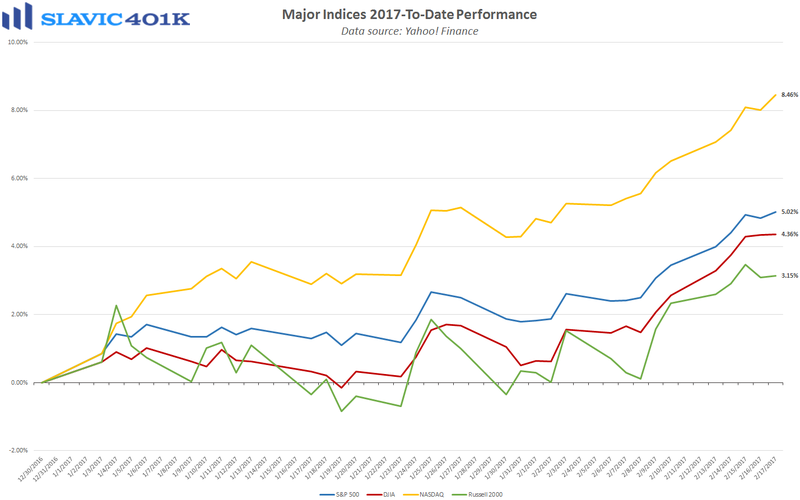 On the other hand, the inflows resurgence could signal reduced worries about geopolitical uncertainty, tightening monetary policy, and a corporate earnings recession, with such concerns being outweighed by optimism regarding the prospect for tax cuts, reduced regulation, and a generally pro-business environment under the new administration. 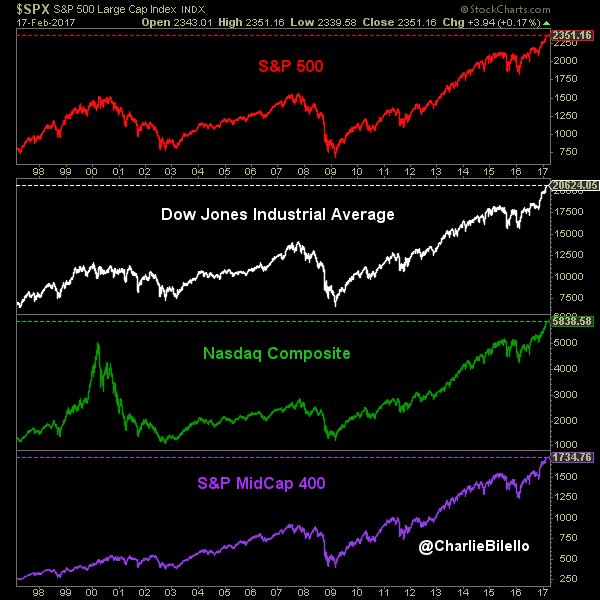 However, with the S&P 500 up roughly 10 percent since the election without any substantial pullback (profit-taking), many investors still fear that equities have risen too high too fast. For retirement savers, though, the focus should be less on near-term fluctuations in the stock market and more on the long-term goal of amassing wealth. Such efforts can be enhanced with the consistent use of tax-advantaged savings vehicles, dollar-cost averaging, and regularly consulting with a professional financial advisor. As always, we are here to help with any questions you may have. To recap a few of the things we learned about the economy last week, the positives included that building permits rose, retail sales growth firmed, manufacturing activity on the east coast improved significantly, U.S. businesses’ average stock-to-sales ratio fell to a 24-month low, small business owner optimism rose to a 12-year high, and the number of Americans filing for unemployment insurance held near a historic low. 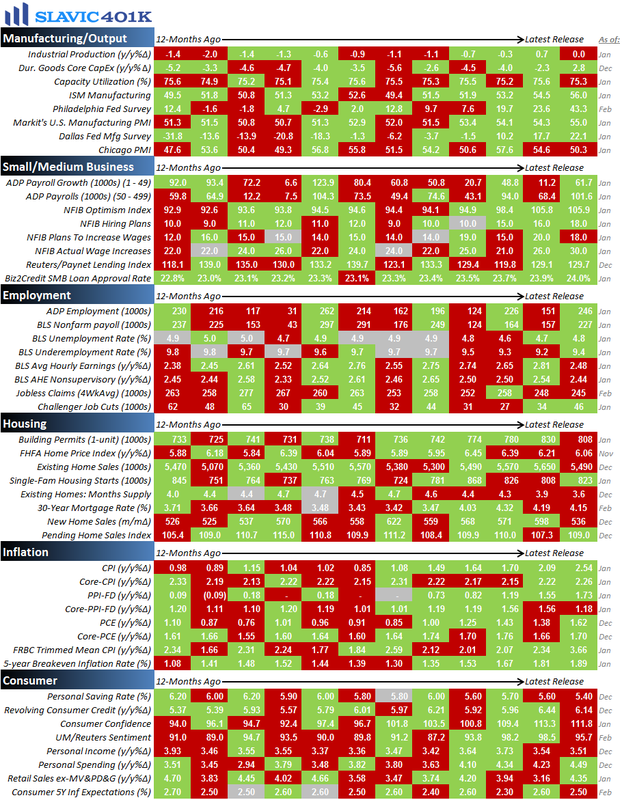 As for the negatives, mortgage and refinance applications declined, housing starts moderated, homebuilder confidence softened, industrial production contracted, capacity utilization fell, and both wholesale and consumer inflation pressures continued to build. 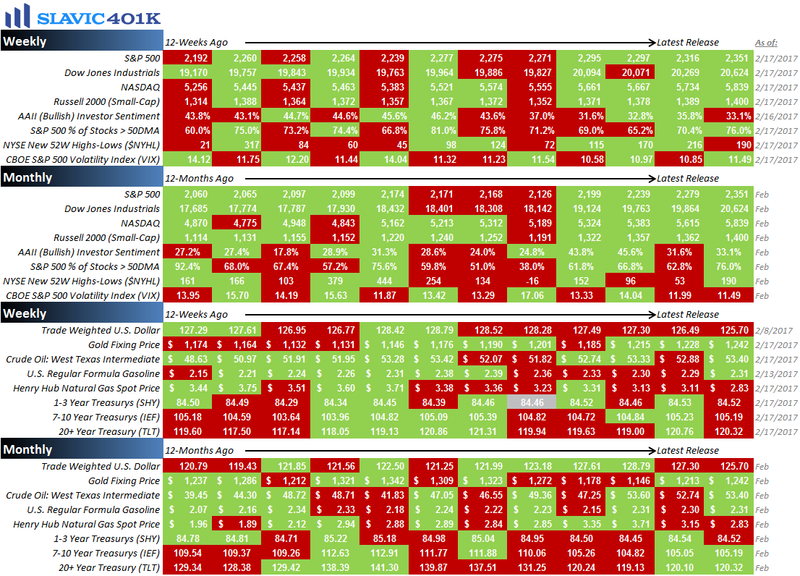 This holiday-shortened week the pace of economic data remains slow but there are still several important reports on housing, manufacturing, employment, and consumers scheduled to be released, along with the potentially market-moving minutes from the latest Federal Open Market Committee (FOMC) meeting due out tomorrow afternoon.